This cosy oversized sweater is made from 84% recycled denim, lovely and warm for the winter months. It would look great paired with chinos or skinny jeans. The recycled material for this sweater was shredded, blended with 16% cotton, and then spun into new yarn and reused. Mud Jeans is an award-winning European brand that ships internationally. They have developed a unique and highly innovative business model based on the idea of a circular economy, where waste is turned into something new, and harmful consumption is reduced. Reducing textile waste is built into the DNA of Mud Jeans. Not only does recycled demin use significantly less water than new denim, Mud Jeans work with manufacturers who are using extraordinary filtration and laundry techniques that reduce water consumption and the use of polluting chemicals, and recycle up to 90% of the water that they use. Cotton production accounts for roughly 25% of the global insecticides market; Mud Jeans support sustainable farming by working with Better Cotton Initiative (BCI) and Global Organic Textile Standard (GOTS). 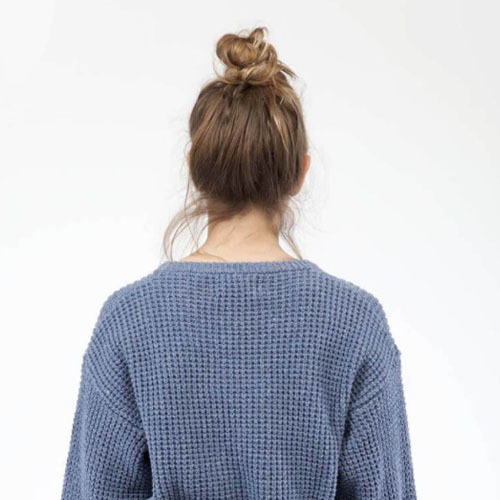 If you send them your unwanted jeans, Mud Jeans will upcycle them into one-of-a-kind vintage pieces or reuse all of the materials and turn them into yarn for new products, like this sweater, and give you a 10 euro discount on your next purchase. Jobs are not lost through this business model: in fact, new jobs are created in the field of recycling and remanufacturing. Mud Jeans list all of their manufacturers on their website’s About Us page. They select their manufacturers carefully and are totally transparent about where each item of clothing was made, and are totally committed to ensuring safe working conditions for everyone in their supply chain. They are a member of the Fair Wear Foundation, and partner with the Fairtrade Foundation.